I wish to express my gratitude to all of the faculty, students, staff, and archival professionals who contributed their time and expertise to the project. Two individuals, though, merit special mention for their work on the website. Amanda McQueen was not only the primary research assistant on the Wisconsin Nitrate Film Project, but also the main designer and builder of the webpages. Special thanks to Amanda for all of her tireless work, both on the website and for all of her contributions to the project as a whole. Thanks also to Michael Trevis for his advice and assistance on several technical issues related to the building of the webpages. Primary funding for the Wisconsin Nitrate Film Project was provided by the National Endowment for the Humanities. The Project received additional financial assistance from The Graduate School of UW-Madison. The WCFTR thanks them both for their generous support. Lastly, the WCFTR also expresses our appreciation to the Project’s co-sponsors and partners: The Mahanthappa Research Group and the Wisconsin Historical Society. 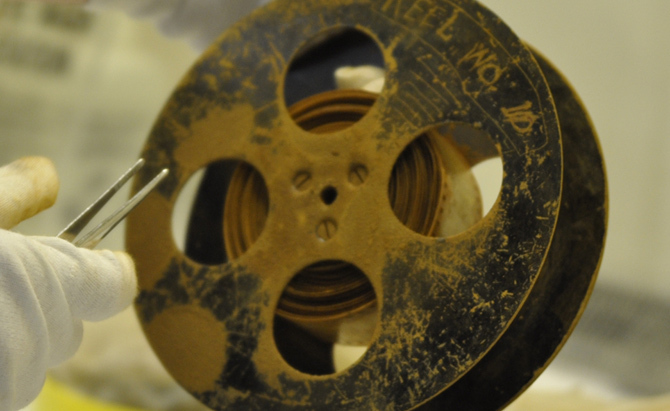 View the Wisconsin Nitrate Film Project here: http://wcftr.commarts.wisc.edu/projects/wisconsin-nitrate-film-project.